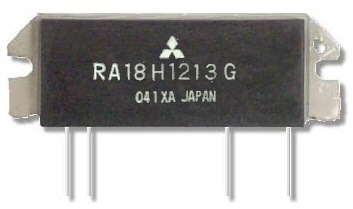 The RA18H1213G is a 18-watt RF MOSFET Amplifier Module for 12.5-volt mobile radios that operate in the 1.24- to 1.30-GHz UHF range. Direct equivalent to : M57762 , M67711 , M68719 . The battery can be connected directly to the drain of the enhancement-mode MOSFET transistors. Without the gate voltage (VGG=0V), only a small leakage current flows into the drain and the RF input signal attenuates up to 60 dB. The output power and drain current increase as the gate voltage increases. With a gate voltage around 4V (minimum), output power and drain current increases substantially. The nominal output power becomes available at 4.5V (typical) and 5V (maximum). At VGG=5V, the typical gate current is 1 mA. This module is designed for non-linear FM modulation, but may also be used for linear modulation by setting the drain quiescent current with the gate voltage and controlling the output power with the input power.